Please note we are revising the Teacher Training Program to provide an in-depth training for the needs of different healthcare practitioners. The descriptions below of the levels of training will be expanded to include more requirements for a higher standard of competency. Provisional changes below are provided so that applicants can plan their prerequisites at this time. IMPORTANT – All applications for OMC teacher training must be submitted and candidates accepted before the start of the January-February, May-June or Sept-October sessions. Please read the application requirements in the document at the end of this page. The Professional Training Path is designed for professionals in healthcare, education, or human resources interested in cultivating their mindfulness practice. This training program is experiential and focused on cultivation of personal mindfulness practices. It provides professionals with a base for developing clinical mindfulness skills and a foundational understanding of mindfulness interventions. Training in the foundations of mindfulness and the MBSM program can span up to one year of study and practice; it consists of participation in one of the 8-week MBSM courses offered at the Ottawa Mindfulness Clinic, guided self-study of current research and books on Mindfulness Interventions, a silent retreat, and the Teacher Training Retreat. The MBSM programs are Mindfulness for (M4) Stress Management, M4-Pain Management, M4-Operational Stress Injury (First Responders & military only), and M4-Burnout Resilience. Please also note that all participants in the professional training are assessed at each stage for their suitability to continue to the final Teacher Training Retreat or to other levels. 1- Minimum of one-year meditation practice in a recognized tradition. Meditation practices are defined as periods of 30 mins or more in sitting meditation (guided or silent). Longer meditations can alternate 10 min periods in walking meditation with sitting meditation. 2- Completion of a 5- to 10-day silent, teacher-lead retreat in a recognized tradition. 3- A background and/or training in mental health that includes an understanding of mental health issues. Applicants must be accepted into the Professional Training Program BEFORE participating in the M4 Program as a participant/observer. 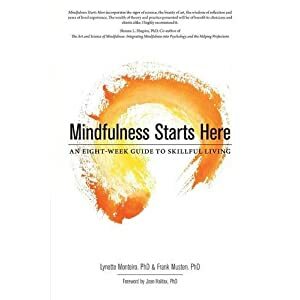 This module is composed of exploring the literature and foundation of mindfulness practices. (1) participation in one of the M4 Programs which provides the opportunity to observe how the program is delivered and to experience the process of the program itself. (3) submission of summary papers of reading material topics. Successful completion of the program provides a Level I certificate of completion in Foundations of Mindfulness Interventions & the essentials of the MBSM Program. This level does not permit the delivery of the 8-week MBSM program. Please note that this level is not necessarily suited for everyone with an aspiration to teach a mindfulness curriculum. Participants may be required to further develop their practice skills or advised to continue at the foundational level in their scope of practice. In order to teach the M4 curriculum, participants are required to teach one 8-week session under full supervision. There are 9-10 supervision sessions: one before the course, one after each class is taught, and a summary feedback session. Trainee skills are evaluated using the MBI-TAC. This permits the participant to be designated as a qualified M4 Teacher. A notation is provided that is appended to the Level I certificate of completion. Participants in this path are required to co-teach three or more rounds at the OMC in partnership with senior teachers and are required to participate as coaches at the professional training retreats. They are also required to maintain a schedule of 5-10 day teacher-lead silent retreats annually and attend retreats/workshops on Buddhist Foundations and ethics of mindfulness. A certificate is provided and the candidate is listed on the OMC website as a Certified M4 teacher. A PDF of the Teacher Training Path is available here Teacher Training Path – July 2018.